Bleach is known for its strong cleaning powers that can deal with harmful bacteria and germs. Unfortunately, no matter how careful you are, there is always the risk that you’ll end up with a bleach stain on your clothing. Before you let panic set in, know that you can learn how to remove bleach stains with several different inexpensive techniques. While technically you can’t remove bleach stains, but with the following techniques, you can restore the color to the discolored fabric that is due to a bleach spill. When chlorine bleach gets on the material, it almost immediately removes the fabric color and leaves a noticeable white or yellow stain on the clothing. 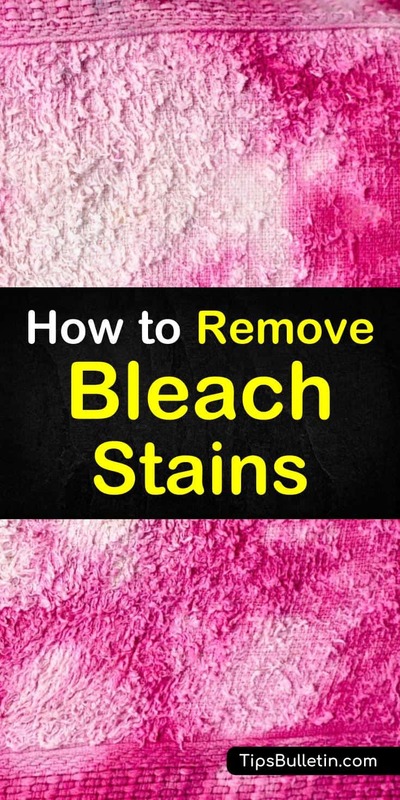 The way to get bleach stains out of clothes is to restore the color to the stained spots. While preventing a bleach stain is much easier than getting rid of one, there are simple ways that you can remove bleach stains from common household surfaces. When dealing with a stained piece of fabric as a result of a bleach spill, it is critical to deal with the issue quickly, because the longer the bleach is allowed to sit on the fabric, the more damage it can do. If the bleach is allowed to stay on the material for too long, you can end up with a hole in your fabric. So, the first thing that you need to do is neutralize the bleach to prevent further damage. Sodium Thiosulfate, which is a photographic fixer, can be used to neutralize bleaching agents and restore fabrics and other surfaces that are affected by bleach stains. It can be used as an immediate spot treatment to neutralize bleach before it can stain your clothing. Dip a clean, white cloth in the sodium thiosulfate and blot the affected area until the stain begins to disappear. Rinse the fabric with cold water and repeat until you aren’t able to make any more progress with the stain. You’ve probably asked this question at least once in your life, “What do I do if I get bleach on my shirt?” The answer is simple, try applying white vinegar to the stain. Vinegar has long been used as a color restoration solution. The acids in the vinegar will help to dissolve fabric that may be causing the bleach stain to stand out. You want to use white vinegar conservatively when treating bleach stains because with enough exposure it will eventually damage your cotton fabrics. Before you try this method, it is incredibly critical that you ensure that you rinse all of the bleach out of the fabric. When you mix vinegar and bleach, the ingredients release chlorine gas, which is extremely toxic. To use vinegar to get bleach stains out, soak a clean, white cloth in the vinegar. Blot the stained area until the fabric doesn’t hold any more vinegar. Rinse the fabric with cold water and repeat the process until the stain disappears. Another easy way for how to get bleach stain out of your favorite garment is to use a fabric marker to cover up the stain. You can find fabric markers in a variety of colors at any craft or fabric store. When you find a color that matches the affected clothing, gently color in the stain. Be sure not to apply too much in at once. If you happen to color the stain too much, you can use rubbing alcohol on a cotton round to remove the excess ink. Most fabric markers are safe to wash; however, it’s best not to use any bleaching agents on those garments that you’ve used the markers on. When you try to remove blood from your upholstery or carpet make sure you do not spill any bleach. If you happen to spill bleach on your carpet, the best thing you can do is to act quickly. If the spill is left untreated for too long, it can remove the color or permanently discolor your carpet, making it almost impossible to remove. It is crucial that you take the proper safety precautions when dealing with removing bleach stains. Be sure to protect your hands and clothing and work in a well-ventilated area. Here’s how to remove bleach stains from your carpet. Start with a clean, white cloth, and blot as much of the excess bleach away from the affected area as you can. Make sure you avoid rubbing the spot, so you don’t increase the size of the stain or push the bleach further into the carpet fibers. Add the warm water to a bucket and stir in the dish soap. Apply the solution to the stained area and blot more of the bleach away. Rinse the area with cold water. Take several paper towels and lay them over the stain to try and absorb as much water as possible. Allow the area to dry. Once the area has dried, go over it with the vacuum. Don’t despair if you aren’t able to completely remove the stain. While you might not be able to reverse the whitening effect of the bleach successfully, there are ways that you can cover up the stain. If you are dealing with small blemishes, you can use a carpet repair kit and replace the damaged carpet or use fabric pens to recolor the affected area. Bleach is a beautiful household cleaning product, but particularly after you bleach your hair its unpleasant odor can leave your hands smelling not so pleasant. One of the fastest ways to remove the overpowering smell of bleach from your hands is to rub them with lemon, rather than washing them with hand soap. Along with being an effective natural cleaner, it is also a powerful odor eliminator that can get rid of all kinds of foul and stinky smells. Chlorine bleach is known to be a powerful household cleaning agent, but one that has to be used with caution to avoid staining fabrics. With these simple techniques for removing bleach stains, you no longer need to panic over a little, spilled bleach. 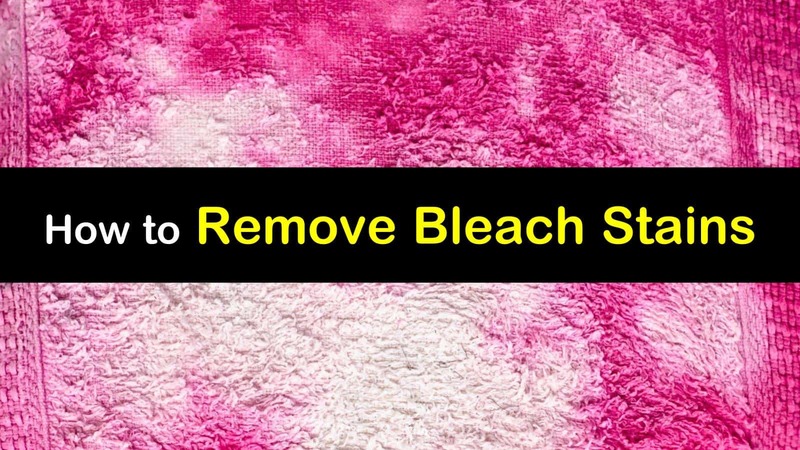 These simple remedies will help stop and reverse the whitening effect of bleach if it happens to drop on your clothing or carpet. We hope you enjoyed learning about how to remove bleach stains. If you found this information useful, please feel free to share it with all your friends and family.